Among the highest impact strategies documented in our Kindergarten Writing and the Common Core program, our “heart words” strategies are the most powerful for building writing stamina and fluency! Writing “heart word” sentences builds the reading brain. Make learning visible—to the child, parent and teachers!! All posters are FREE downloads as a part of Nellie Edge Online Seminar #3. 1. To provide crystal clear learning targets and make learning visible for teachers, parents and students we use color coordinated wall charts, floor posters, and individual rings of high-frequency “heart words” to motivate learners to work hard and meet their goals. Children know there are two kinds of words: Words they know “by heart” and words they listen to, stretch out, and write the sounds for. The end goal of our writing workshop model is for children to fluently use “heart words” in sentences, accurately write CVC words, and fearlessly tackle any unknown word in their writing. More proficient students may add sets of first and second grade-level high-frequency words. There is no ceiling on joyful systematic learning! Provide, Multisensory, Memorable, and Meaningful Teaching and Learning. The word “love” is our anchor word. The “heart word” sentence “I love you.” is the first one practiced for mastery. ALL children need to see themselves as readers and writers of words and messages that matter! Teachers use fingerspelling to help children develop fluency with “heart words” and CVC words, referring back to the key phonics symbols from their ABC Phonics program as needed to build the reading brain. Teachers make copies of the Sing, Sign, Spell, and Read! CD for family listening and often send home the anthology pages and fingerspelling cards (permission is granted). Sing, Sign, Spell and Read! Resources are a FREE download with Nellie Edge Online Seminar #3, or purchase from our Online Bookstore. They will soon also be available at our TpT store. 3. Ongoing Assessment Drives Instruction and Learning is Celebrated! There is a visual acknowledgement (or celebration) for the child who masters the next “heart word” set. Each child soon has a photo on an award, or on a page in the Hip Hip Hooray! class book. We celebrate hard work! Early in the year children learn to draw animals and write their own books using high-frequency “heart word” sentences. Our expanded writing workshop model gives children choice of topics and opportunities for authentic, meaning-centered practice. The kindergarten writing program includes students as authors and illustrators, publishing their own books! We make copies of these books to use as mentor texts for next years’ students. 5. Art, creativity, voice, and playfulness are part of the writing process! We teach our “T-h-e e-n-d. The end.” chant and children proudly write these important “heart words” at the end of their personally authored and illustrated books! Your Professional Development just got easier this summer! Thank you for an excellent question! It was interesting looking up the first several sets of Dolch words and realizing, in fact, that they are quite different from the first words our young children learn to write and read “by heart” in our kindergartens with strong writing workshop models. The first list of Dolch words include words such “yellow” and “red” and number words such “one” and “two”, which may have been very common in older beginning readers; however, we rarely see these words in kindergarten writing pieces. Our “heart words” are based on action-research in kindergartens. Our documentation shows these words make up more than 60% of the words young writers use, and these words give them instant writing power. 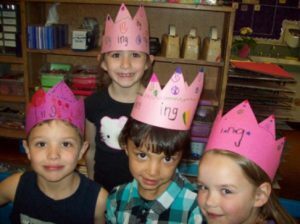 We start with high-frequency “heart word” sentences such as “I love Mom,” “I see my cat,” and “I like the dog”, and teach children how to draw animals and write books so there is authentic meaningful sentence writing from the first month of school. 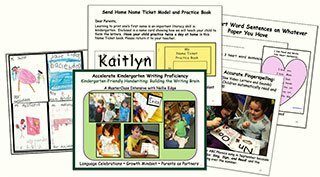 Our purpose is for children to develop reading and writing fluency with the words they actually use. 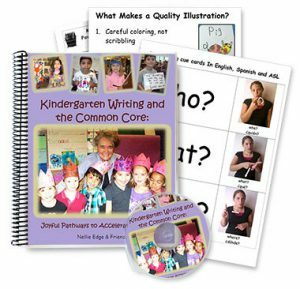 You will see in Nellie Edge Online Seminar #3, Teaching High-Frequency Sight Words, that we teach the Common Core writing word “because” early on so our children soon gain confidence writing compound sentences. Our end goal for kindergarten writers is that they become prolific writers who love to write! 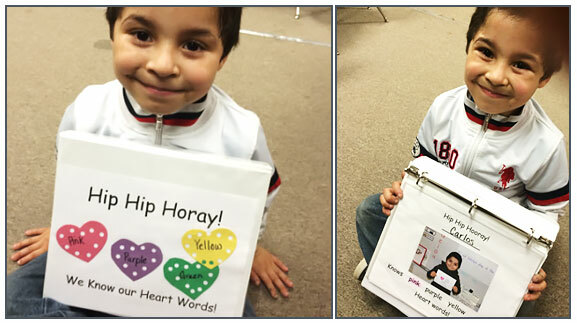 What some teachers have chosen to do if their school has a mandated sight word list is to focus on the first two sets of “heart words” —for writing and reading power—and then add the district’s required word list as Sets 3 and 4 (yellow and green “heart words”). 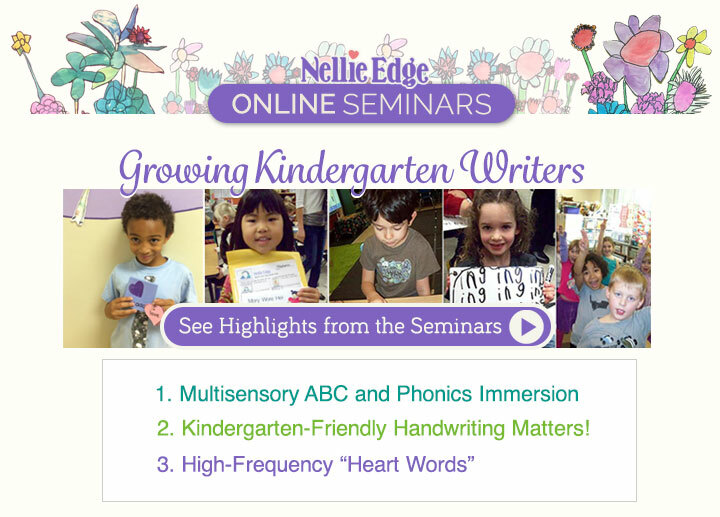 You will see in Nellie Edge Online Seminar #3 that giving children crystal clear achievable targets of 15-16 high-frequency reading and writing words at a time—and using multisensory teaching—accelerates the learning of any word list. Thank you for your comment. Kindergarten teachers tell us “heart word sentences” are the most powerful part of building writing stamina. You may also want to see the more complete heart word page on our new website. To save you time, the Online Seminar includes all of the props!